Genuine Baldor 1/2 horsepower single-phase replacement motors are wired for 115/230V AC power and rated with 900-3600 rpm. 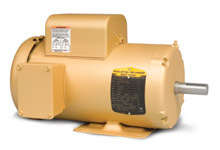 Use in conveyors, pumps, and other applications requiring durable service. Single phase replacement motors wired for 115/230V AC power, rated at 1 horsepower with 900-3600 rpm. Genuine Baldor equipment used in conveyors, pumps, and other applications. 2 horsepower single-phase replacement motors are wired for 115/230V AC power. These genuine Baldor motors rated at 900-3600 rpm. equipment are used in conveyors, pumps, and other applications.